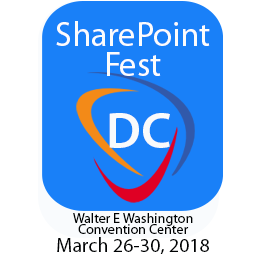 SharePoint Fest returns to Washington, DC March 26 - 30, 2018 at the Walter E. Washington Convention Center. CLM Matrix, the leading provider of solutions that transform the way companies manage contracts, trade agreements and other important documents that contain valuable strategic information, will be on the expo hall floor as a gold sponsor of this annual technology conference. At SharePoint Fest DC, an exclusive SharePoint and Office 365 technology conference, attendees will learn from the brightest minds in the SharePoint universe! SharePoint Fest DC will begin with two days of pre-conference workshops on March 26 and March 27, followed by a three-day conference (including an expo hall) March 28 - 30. Be sure to stop by the CLM Matrix booth to see how their Matrix Software solutions significantly reduces risk and costs while increasing revenues and vastly improving productivity! CLM Matrix is a Microsoft Gold Certified Partner and a leading global innovator of SharePoint-based contract lifecycle management software products that transform the way organizations manage contracts, trade agreements and other important documents that contain valuable strategic information. CLM Matrix products are used by customers worldwide across more than 22 unique industry verticals to standardize, streamline and automate their document centric collaborative processes. The company focuses on building intuitive software that leverages and extends existing Microsoft Office/SharePoint technology in three key areas: enhanced rule and policy based workflow, dynamic server-side document generation and no-code configuration. CLM Matrix is headquartered in Dallas, Texas and maintains a global network of experienced deployment and support specialists. The SharePoint Fest series will be entering their 8th year in 2018. SharePoint Fest DC offers a three-day conference (with two optional pre-conference workshop days) that brings together SharePoint enthusiasts and practitioners, with many of the leading SharePoint experts and solution providers in the country. Attend SharePoint Fest DC where attendees will be able to attend workshops and seminars – taught by Microsoft Certified Trainers, Microsoft engineers, and Microsoft MCM's and MVPs – covering Enterprise Content Management, Implementation/Administration, Business Value, Search, Business Intelligence, Office 365 and SharePoint Development. Attendees will be able to choose one complete learning track or mix and match based on what content best meets their current needs. At SharePoint Fest DC, there will be sessions created for SharePoint administrators, software developers, business analysts, information architects, and knowledge workers, which will ensure that attendees walk away with as much knowledge as they desire to truly leverage SharePoint in their current environment.